In RT LIVE has 2 modes for lap timing, either fully automatic mode, or manual mode. The lap timing mode is set on the �Settings� screen of the RT Cloud website, as shown below. Default option is Automatic mode. In fully automatic mode, the RT LIVE unit sends its current position to the RT Cloud server. The server identifies which circuit is nearest and sends back the markers for the start and end of the circuit. The RT LIVE unit uses this information for lap timing. In this mode there is no user set up required. In manual lap timing mode, user can select and upload their own lap file. Typically the lap file is generated by the Analysis software, using some previously logged data, more information about generating a lap file is available here. The manual mode is useful if either the RT LIVE unit is to be used at a circuit that is not in the RT track database , or if the user has a different preferred position for lap markers. The lap times calculated by the RT LIVE unit are output on serial port and can be displayed on any attached DASHx product. 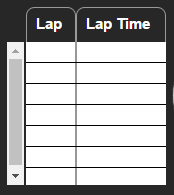 The lap times are also transmitted back to RT Cloud server and will be displayed on the web interface under �Live Data� tab as shown below. Note that in an installation where the RT LIVE unit is part of a bigger system, for example that includes a DL1, then lap times might be output from another device and input into the RT LIVE unit. When the RT LIVE detects lap timing information on its serial port, then it will stop its own lap internal lap timing calculations and use the externally calculated lap times.